​2. It should be neither too broad or too narrow - Your topic must be narrow and focused enough to be interesting, yet broad enough to find adequate information. The Lotus Chart can be used to help narrow down your research topic. Use it to expand and tease out concepts based upon a broad theme. Begin by placing your broad theme or idea in the centre and then, like a mind map, add the connected ideas to the surrounding coloured boxes. Transpose the connected ideas from the coloured boxes to the corresponding coloured square in the outer boxes. Then further expand. If needed, you can take one of the expanded concepts and place it in the centre of a new Lotus Chart and repeat the process. The process of formulating a clear, purposeful and effective research focus question is a common difficulty faced by many novice researchers (Daymon & Holloway 2010). It is, however, the most critical aspect of any successful research project (Alvesson & Sandberg 2013 ; Bryman 2012). The process of crafting a specific research focus question begins by first selecting a general research area. This broad research area should be gradually narrowed down by identifying a specific research problem. The research problem should again be narrowed down by reviewing the available literature to arrive at a research purpose or objective. By refining and narrowing the research purpose the researcher can then arrive at a specific research question (Creswell 2012 ; Koro-Ljungberg & Hayes 2010). There is a range of evaluation criteria that one should use to assess the effectiveness of research questions. Firstly, a research question should be neither too broad nor too narrow (Bryman 2012 ; Alvesson & Sandberg 2013 ). Questions that are too broad often require a large amount of time and resources that can cause the researcher to lose focus. Questions that are too narrow are less likely to make an academic contribution in their field. A good research question will occupy the middle ground. It will be focused enough to allow research of the question in some depth yet broad enough to allow one to consider the significant aspects of the question (Bryman 2012 ; Empire State College n.d.). A second criterion for assessing the effectiveness of a research question is that it should be feasible, that is, it should be researchable, manageable and achievable. A research question needs to be feasible in that it can be easily and fully researched within time and budget constraints. It should not be overambitious and should be within the researchers own research and technical skills. In addition, it should generate new knowledge that makes an academic contribution (Alvesson & Sandberg 2013 ; Punch 2005). Likewise, a good research question should be original and, as such, make an original practical or academic contribution (Bryman 2012). It is also crucial that researchers provide a purpose statement or rationale for their research in order to demonstrate and justify the significance of the study. The rationale should demonstrate how the research could be of practical importance in the field. (Bryman 2012 ; Hartas 2010). The rationale should state the research focus, and the intent of the author. It should also state the aim of the study and whether it is for instructional value, an enriched understanding of a topic or a challenge to established theories or practices (Alvesson & Sandberg 2013 ; Koro-Ljungberg & Hayes 2010). Qualitative and quantitative frameworks have long been expressed as a dichotomy by research academics. These frameworks are seen to differ in terms of their approach, epistemological position, ontological position and type of data collected (Grogan & Simmons 2007; Hughes 2010). The discussion on paradigms can be rather complex and weighty and so Table 1. shown below has been adapted from Bryman (2012). The full complexity of these concepts is described in simplified terms. Simply put, quantitative research is research that is typically expressed in numbers whereas qualitative is not. It is typically expressed in words (Greener 2011 ; McMillan & Wergin 2010). In terms of approaches, research can be seen to be either deductive or inductive. Deductive approaches start out with a research question or theory which must tested using data from observations or findings. Inductive approaches will begin with the observations and findings and then from the data a research theory will be devised. In most cases deductive approaches are aligned with quantitative research and inductive with qualitative (Bryman 2012). Epistomological position of research is concerned with what should be regarded as acceptable knowledge and how the social world should be studied (Bryman 2012). Positivists advocate for social sciences to be studied in the same way as the natural sciences. Interpretivism, on the other hand, advocates for the study of things in terms of their context and the subjective way people interpret reality (Bryman; de Vaus 2001). In this way quantitative research is seen to align with positivist epistemology and qualitative with an interpretivist position. Ontology is the concern of whether the world exists independently of our perceptions of it. Objectivism views social phenomena as external and outside of our reach or influence (Greener 2011). Constructivism views our perceptions of the world as being internally constructed and as being continually reshaped by our interaction with it (Bryman 2012). 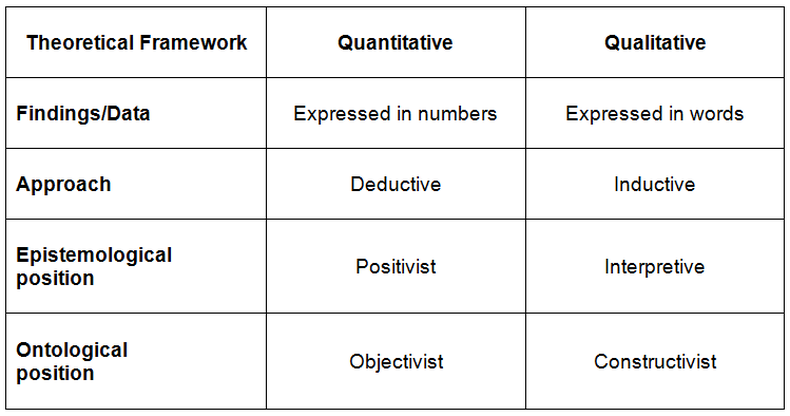 Objectivism is viewed as aligning with the quantitative framework whereas constructivism is considered to fit well with the qualitative framework (Bryman Mackenzie & Knipe 2006). Daymon, C., & Holloway, I. (2010). Qualitative Research Methods in Public Relations and Marketing Communications (2nd EditionEd.). Florence, KY, USA: Routledge. de Vaus, D. A. (2001). Research design in social research. Thousand Oaks: CA. Sage Publications. Greener, I. (2011). Designing social research: A guide for the bewildered. London: SAGE Publications. Grogan, M., & Simmons, J. (2007) Taking a critical stance in research. In Research methods in educational leadership and management. (2nd Ed.) Thousand Oaks, CA: SAGE Publications, 13-36. Hartas, D. (2010). Doing a literature review. In D. Hartas (Ed. ), Educational research and inquiry : qualitative and quantitative approaches (pp. 96-109). London : Continuum. Hughes, P. (2010). Paradigms, methods and knowledge. In Doing early childhood research : international perspectives on theory & practice (2nd ed.) Crows Nest, NSW : Allen & Unwin. 35-61. McMillan, J., & Schumacher, S. (2006). Research designs and reading research reports. In Research in education: Evidence-based inquiry (6th ed.). Boston: Pearson/Allyn and Bacon. 21-49.